Twistings cleanse our organs and keep our spines youthful. They feel great! But, repetitive twisting without attention to alignment can eventually lead to injury. So here’s a version that’s safe and endlessly beneficial: Marichyasana III with block and wall. Try it with me and see how the spine stays long, the vertebrae feel equally spaced and the chest/sternum/heart area are magnificently able to open. Deepen your groins, open your hips and strengthen your core. Restore the entire body! Beautifully guided with rich verbal cues to transform. 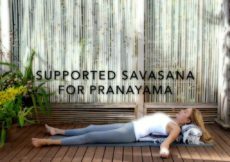 Learn how to set up for a heart-opening prana infused Savasana and experience the beauty of breath work meditation. Profoundly healing and restorative. Yoga alignments for a variation of Warrior 1, with the back heel lifted, that bring new healthy experiences to the way we practice this pose.